UNITED NATIONS, Nov 11 (IPS) - The continued widespread economic recession - aggravated by the recent Ebola outbreak in West Africa - is threatening to undermine the U.N.'s highly-touted post-2015 development agenda. Still, Secretary-General Ban Ki-moon is placing his trust and confidence on two key upcoming summit meetings: a G20 gathering of world leaders in Brisbane, Australia later this week, and the International Conference on Financing for Development (ICFD) in Addis Ababa, Ethiopia, next July. 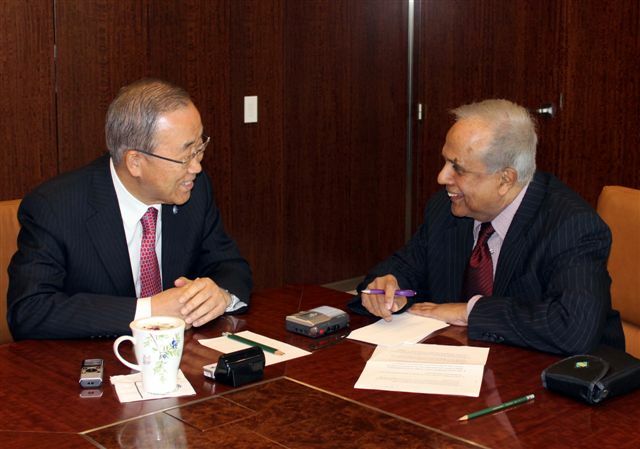 In an interview with IPS, just before his departure to Brisbane, he described the G20 as "the world's primary global economic forum", while the ICFD, he predicted, will be "one of the most important conferences in shaping sustainable development goals (SDGs)." Ban has already cautioned world leaders of the urgent need for "a robust financial mechanism" to implement the proposed SDGs - and such a mechanism, he said, should be put in place long before the adoption of these goals in September 2015. In a letter to G20 leaders, he says the successful implementation of the growth and sustainable development agendas will depend largely on mobilising "all sources of financing". "It is difficult to depend on public funding alone," he told IPS, stressing the need for financing from multiple sources - including public, private, domestic and international. The G20, a rare mix of both developed and developing countries, includes Argentina, Australia, Brazil, Canada, China, France, Germany, India, Indonesia, Italy, Japan, Republic of Korea, Mexico, Russia, Saudi Arabia, South Africa, Turkey, the United Kingdom and the United States, plus the European Union. Overall, the G20 represents about two-thirds of the world's population, 85 per cent of global gross domestic product and over 75 per cent of global trade. The G20 president, this time around Australian Prime Minister Tony Abbott, usually invites several guest countries to participate in the summit. The presidency rotates on a geographical basis. The countries which previously hosted the G20 summit include the United States (in 2008 and 2009), the United Kingdom (2009), Canada (2010), the Republic of Korea (2010), France (2011), Mexico (2012) and Russia (2013). At the meeting in Brisbane Nov. 15-16, Abbott will welcome Spain as a permanent invitee; Mauritania as the 2014 chair of the African Union; Myanmar as the 2014 chair of the Association of South-East Asian Nations (ASEAN); Senegal, representing the New Partnership for Africa's Development; New Zealand; and Singapore. The ICFD, scheduled for July 2015, is billed as a U.N. conference and will be attended by all 193 member states. Speaking of financing for development, Ban said official development assistance (ODA), from rich nations to poorer ones, "is necessary but not sufficient." According to the latest available statistics, only five countries - Norway (1.07 percent), Sweden (1.02), Luxembourg (1.00), Denmark (0.85) and the United Kingdom (0.72) - have reached the longstanding target of 0.7 of gross national income as ODA to the world's poorer nations. Meanwhile, the economic recession is taking place amidst the growing millions living in hunger (over 800 million), jobless (more than 200 million), water-starved (over 750 million) and in extreme poverty (more than one billion), according to the United Nations. Asked about a proposal for innovative sources of financing for development - including a tax on foreign exchange transactions - Ban said he has appointed a former French cabinet minister, Philippe Douster-Blazy, as his special adviser to explore these funding sources. The proposal for innovative financing was approved at the 2002 ICFD in Mexico and it has raised about 2.0 billion dollars so far. Ban's most formidable task will be to ensure that rich countries deliver on their pledges, made in 2009, to provide a staggering 100 billion dollars by 2020 for a Green Climate Fund to prevent the most disastrous consequences of climate change. "I need at least 10 billion dollars to operationalise the fund," he said. So far, about 2.5 billion dollars have been made available. Meanwhile, in his letter to the G20 leaders, Ban says new threats, including geopolitical tensions and the Ebola crisis, "have emerged to create further uncertainty" for the U.N.'s development agenda. "The G20 Brisbane summit is well timed to provide the leadership that will translate into strong global growth and positive change in people's lives," he wrote. "Therefore, I urge you and your fellow leaders to seize the moment in Brisbane and set the stage for success in our shared work to build a more sustainable and prosperous world for all." The United Nations, he said, "stands ready to partner with you in your endeavour in Brisbane - and beyond." But a lingering question remains: how many of the world leaders will respond to the call?